The File Detection Test is one of the most deterministic factors to evaluate the effectiveness of an anti-virus engine. These test reports are released twice a year including a false alarm test. For further details please refer to the methodology documents as well as the information provided on our website. In this test, the following 20 up-to-date Security Products were tested using 240859 prevalent malware samples. AVG, AVIRA: asked to do not enable/consider the informational warnings of packers as detections. So, we did not count them as detections (neither on the malware set, nor on the clean set). F-Secure, Sophos: asked to get tested and awarded based on their default settings (i.e. without using their advanced heuristics / suspicious detections setting). AVIRA, Kaspersky: asked to get tested with heuristic set to high/advanced. Please note: Several products make use of cloud technologies, which require an active Internet connection. Our tests are performed using an active Internet connection. Users should be aware that detection rates may in some cases be drastically lower if the scan is performed while offline (or when the cloud service is unreachable for various reasons). The cloud should be considered as an additional benefit/feature to increase detection rates (as well as response times and false alarm suppression), and not as a full replacement for local offline detections. Vendors should make sure that users are appropriately warned in the event that the connectivity to the cloud is lost, which may considerably affect the protection provided, and e.g. make an initiated scan useless. While in our test we check whether the cloud services of the respective security vendors are reachable, users should be aware that being online does not necessarily mean that the cloud service of the products they use is reachable/working properly. In fact, sometimes products with cloud functionality have various network issues due to which no cloud security is provided, but the user is not warned. AMTSO has a rudimentary test to verify the proper functionality of cloud-supported products. The test-set used has been built consulting telemetry data with the aim of including prevalent malware samples from the last weeks/months prior to the test date which are/were endangering users in the field and consisted of 240859 samples. Furthermore, the distribution of families in the test-set has been weighted based on family-prevalence and was build based on Microsoft’s global telemetry data. This means that as more prevalent a malware family is, as more samples from that family are included in the test-set. This dendrogram shows the results of the cluster analysis. It indicates at what level of similarity the clusters are joined. The red drafted line defines the level of similarity. Each intersection indicates a group. The malware detection rates are grouped by the testers after looking at the clusters built with the hierarchal clustering method. However, the testers do not stick rigidly to this in cases where it would not make sense. For example, in a scenario where all products achieve low detection rates, the highest-scoring ones will not necessarily receive the highest possible award. The test-set used contained 240859 recent/prevalent samples from the last few weeks/months. We estimate the remaining error margin on the final percentages to be below 0.2%. In order to better evaluate the quality of the file detection capabilities (distinguish good files from malicious files) of anti-virus products, we provide a false alarm test. False alarms can sometimes cause as much trouble as a real infection. Please consider the false alarm rate when looking at the detection rates, as a product which is prone to false alarms achieves higher detection rates more easily. 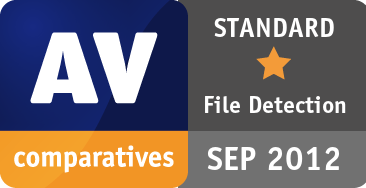 AV-Comparatives provides ranking awards. As this report also contains the raw detection rates and not only the awards, expert users that e.g. do not care about false alarms can rely on that score alone if they want to. The awards are not only based on detection rates – also false positives found in our set of clean files are considered. Even if we deliver various tests and show different aspects of anti-virus software, users are advised to evaluate the software by themselves and form their own opinions about them. Test data or reviews just provide guidance on some aspects that users cannot evaluate by themselves. We encourage readers to additionally consult other independent test results provided by various well-known and established independent testing organizations, in order to get a better overview about the detection and protection capabilities of the various products over different test scenarios and various test-sets. A list of various reputable testing labs can be found on our website. This publication is Copyright © 2012 by AV-Comparatives ®. Any use of the results, etc. 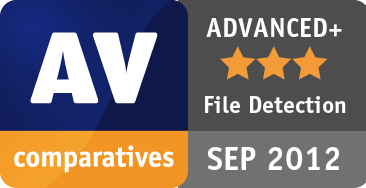 in whole or in part, is ONLY permitted after the explicit written agreement of the management board of AV-Comparatives prior to any publication. AV-Comparatives and its testers cannot be held liable for any damage or loss, which might occur as result of, or in connection with, the use of the information provided in this paper. 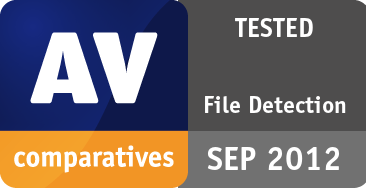 We take every possible care to ensure the correctness of the basic data, but a liability for the correctness of the test results cannot be taken by any representative of AV-Comparatives. We do not give any guarantee of the correctness, completeness, or suitability for a specific purpose of any of the information/content provided at any given time. No one else involved in creating, producing or delivering test results shall be liable for any indirect, special or consequential damage, or loss of profits, arising out of, or related to, the use or inability to use, the services provided by the website, test documents or any related data.